Action from AFC Stanground Sports (hoops) v Moulton Harrox earlier this season. Rob Ames is determined to keep Peterborough Premier Division football in Stanground. Ames is the beleaguered boss of AFC Stanground Sports who called a halt to their top-flight match at Sutton Bridge United at half-time last weekend when trailing 10-0. Tom Flatters (left) scored a hat-trick for Peterborough Sports Reserves last weekend. The city side had started with nine men and lost two more to injury before the break so Ames decided not to put his team through a further 45 minutes of punishment. The matter has been referred to Hunts FA who will deal with it before the Peterborough League become involved. Ames traces the current malaise - his team are now 13th in a 16th team league with a probable points deduction to come - to a merger between his AFC Stanground team and Stanground Sports. The combined club run three teams with the reserves currently propping up Division One and the A team going well in Division Four. “The worst thing I did was agree to merge my team,” Ames admitted. “I get no help whatsoever and it has made me not want to stay in football. “There have been weeks when I have had a bare 11, the reserves have had eight players and yet the A team would have 15. That’s not how the system is supposed to work. “But I will do my best to pull the club out of this rut. We just need to get back to being an individual team, but the League won’t let me split. If I did we would have to start in Division Five. Stanground are without a top-flight fixture tomorrow (November 4), but leaders Moulton Harrox have a tricky trip to ICA Sports. 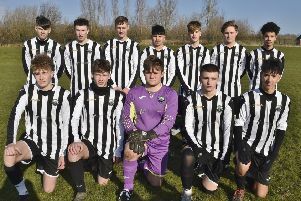 Reigning champions Peterborough Sports Reserves chase a ninth Premier Division win in a row at Holbeach United Reserves, while Stamford Lions chase a 10th consecutive win at Sawtry. Thorney, Leverington and Whittlesey Athletic are in Cambs County Cup action. Premier Division: Deeping Rangers Res v Ketton, Holbeach United Res v Peterborough Sports Res, ICA Sports v Moulton Harrox, Sawtry v Stamford Lions, Sutton Bridge United v Langtoft Utd, Warboys Town v Netherton United. Cambs Challenge Cup: Chatteris Town v Thorney, Leverington Sport v Foxton, West Wratting v Whittlesey Athletic.